Gardeners with plenty of room in a vegetable garden should consider planting several rows of sweet corn for a bountiful harvest later in the summer. Sweet corn grows easily in a sunny location in a vegetable garden. Prepare the soil when the frost threat has passed and enjoy watching the corn emerge from the soil and grow into strong, tall cornstalks. Harvesting fresh corn for eating is one of a gardener’s sweet pleasures. Prepare the garden area by working the top 10 inches of soil. Add between 2 and 3 pounds of granular fertilizer for every 100 square feet of growing area. Sprinkle the fertilizer evenly over the growing area and use the spade to incorporate the fertilizer completely into the soil. Rake the growing area smooth. Create the planting rows. For best results, make a greater number of short rows instead of long rows. This will facilitate better pollination among the plants. Place the rows approximately 3 feet apart. Plant the seeds along the rows, placing one seed every 3 inches. Cover the seeds with 1 inch of soil. Water the corn generously immediately after planting. Make sure the corn has enough water so that it never wilts. This is especially important while the corn kernels are growing. Thin the corn plants when the seedlings are several inches high. Remove plants so that each corn plant is spaced 12 inches apart in the rows. Control weeds around the corn plants. Use a hoe carefully around the plants or remove the seeds by hand to avoid disturbing the corn plants. Fertilize the plants with the corn is approximately 2 feet high. Sprinkle 1 cup of granular fertilizer for every 10 feet of row between the rows. Mix the fertilizer in with the soil around the corn plants and water generously. Harvest corn when the silk protruding from the tops of the ears is a dark brown color. Puncture a kernel and if the juice is milky, the corn is ready for harvest. If the juice is clear, the corn is not ready yet. 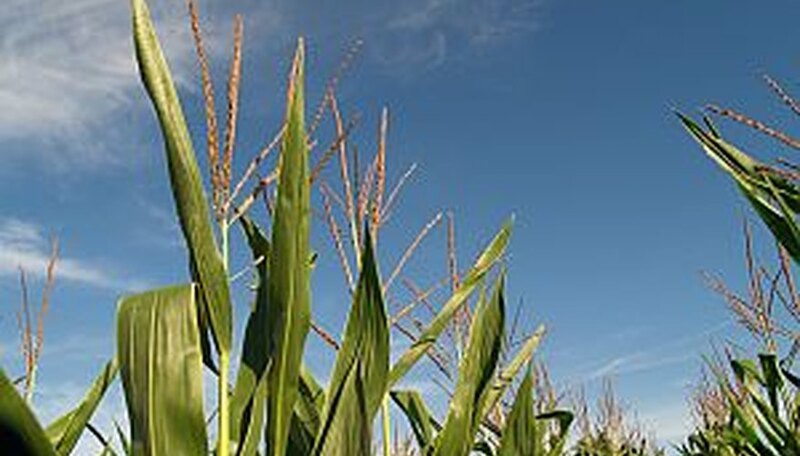 Corn is generally ready for harvest approximately three weeks after the tassels appear at the tops of the cornstalks.